Jose Vinals, the IMF's authority on financial stability, calls for "strong political leadership" to address threats to global economy. NEW YORK (CNNMoney) -- The International Monetary Fund said Monday that the global economy should continue to limp along at a modest pace, assuming leaders in Europe and the United States do not make things worse. In the latest update to its World Economic Outlook, the IMF said it expects the global economy to grow 3.5% this year and 3.9% in 2013. That's "marginally lower" than what the IMF predicted in April. "The global recovery continues," said Olivier Blanchard, director of the research department at the IMF, during a press conference in Washington. "But it is a weak recovery, indeed a bit weaker than we forecast last April." After a better-than-expected performance in the first quarter, the U.S. economy is projected to grow 2% this year and 2.3% in 2013, according to the report. Both rates are down 0.1% from the April outlook. The IMF said its predictions are based on two key assumptions: That euro area governments will implement proposed reforms to stabilize the currency union and that U.S. officials will stop the nation from falling off a "fiscal cliff." "The most immediate risk is still that delayed or insufficient policy action will further escalate the euro area crisis," the IMF report states. The eurozone economy is expected to shrink 0.3% this year, unchanged from the April outlook. In 2013, the IMF now expects eurozone activity to increase 0.7%, down from a previously forecasted increase of 0.9%. The IMF said the political agreements made at the last summit of European Union leaders "are a step in the right direction." Specifically, the fund praised the leaders for trying to break the "adverse links" between governments and banks by allowing the European Stability Mechanism, a bailout fund that has yet to be launched, to recapitalize financial institutions directly. But these agreements face "high implementation hurdles" and the situation in the eurozone "will likely remain precarious until all policy action needed for a resolution of the crisis has been taken," the IMF warns. While it welcomed the agreement on short-term measures, the IMF said more needs to be done to address long-term problems in the currency area. In particular, the fund said eurozone nations need to form a banking union with common deposit insurance and a mechanism to resolve failed banks. 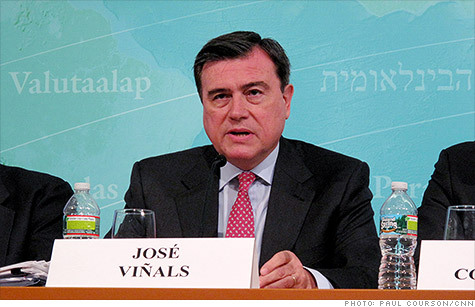 "Now is the time for strong political leadership," said José Viñals, director of the IMF's monetary and capital markets department. "Tough decisions must be made to restore confidence." Viñals said eurozone policymakers need to take immediate steps to curb rising borrowing costs for nations such as Italy and Spain. This could include reactivating the European Central Bank's controversial bond buying program, he said. Italy and Spain are paying interest rates that are as much as 2% higher than what is justified by the "economic fundamentals," according to Viñals. The premium reflects concerns in the bond market about the future viability of the euro currency union. "If you want the euro area to continue on stable ground," said Viñals. "Then you need a banking union and further fiscal integration." The other main threat to global economic growth is in the United States, according to the IMF. "In the short term, the main risk relates to the possibility of excessive fiscal tightening in the United States, given recent political gridlock," the report states. The so-called fiscal cliff represents trillions of dollars in poorly conceived spending cuts and tax increases that start to go into effect in January. Such measures include the expiration of the Bush tax cuts, middle class protection from the Alternative Minimum Tax, and more than 50 "temporary" tax breaks for individuals and businesses that have been on the books for years. The IMF also called on U.S. lawmakers to increase the government's $16.394 trillion debt ceiling. "Delays in raising the federal debt ceiling could increase risks of financial market disruptions and a loss in consumer and business confidence." Meanwhile, the IMF expects developing economies to grow at a slightly slower pace. China, for example, is now forecast to expand 8% this year, down from 8.2% in the previous outlook. The IMF also trimmed its projections for growth in Brazil and India.